On Thursday night, Carrie and Nikki and I (along with our friend Brindha) converged in Atlanta for the TCM Road to Hollywood screening of Seven Brides for Seven Brothers (1954). Nikki arrived first and, despite the packed-to-the-gills house, was able to secure us seats in the third row on the right side of the stage. 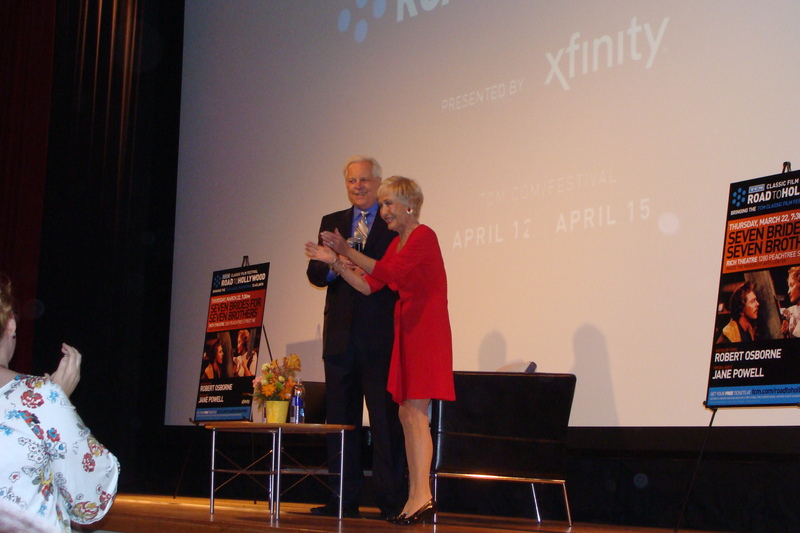 And it turned out that we had excellent seats, as host Robert Osborne emerged from the back of the auditorium and walked down the aisle, pausing in front of us for a moment before taking the stage. A few minutes later, the film’s star, Jane Powell, skipped down the aisle, charming the entire audience with her vivacity and spirit. At 82 years young, Powell is still just as beautiful as in her Hollywood heyday, with a set of gams that instantly invoke envy (as she told us later, she owes her lithe figure to Pilates and walking the streets of New York City!). After a short discussion, Osborne and Powell took questions from the audience, and then we settled in to watch the film. Granted, it wasn’t the best print of the film–the color was off in parts, and in several sections, the film actually skipped a few seconds. But overall, it was wonderful to see this musical staged on the big screen, where it belongs. And the audience really got into the movie, laughing uproariously and sometimes singing along to the songs or quoting favorite lines out loud. It made for a really interesting communal movie-watching experience–a rare thing these days, indeed. 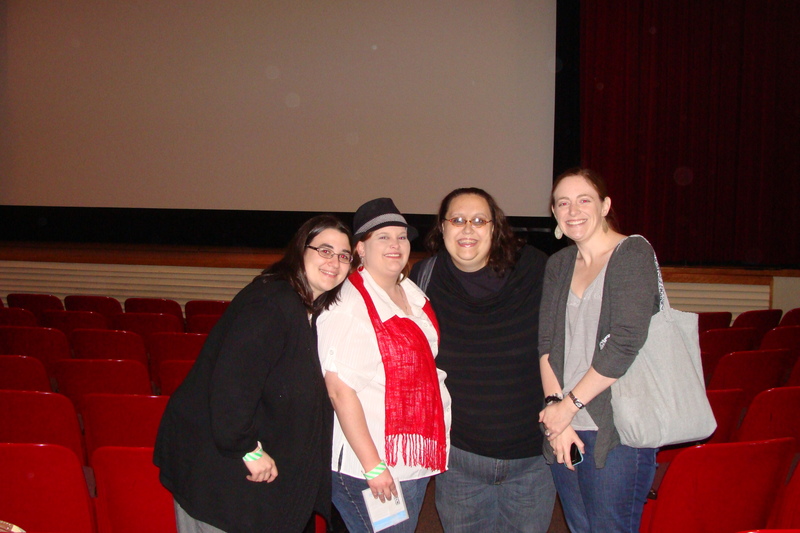 After the show, we were able to meet Jill (also known as “kittenbiscuits“), the talented blogger behind Sittin’ on a Backyard Fence and the new classic film site The Cinementals, where you can read Jill’s reflections on the Seven Brides experience. Overall, it was a wonderful experience, and well worth the trip! Thanks to TCM for scheduling the Road to Hollywood series for those of us who cannot make the trip to the annual TCM Classic Film Festival in Hollywood in April. It brings a little bit of the glamour and excitement our way, and for that, we classic film fans can only be grateful. Glad you had so much fun! I saw Seven Brides on the big screen back in January, and I agree, it’s one of those movies that absolutely belongs on the big screen. It was definitely a blast! I thoroughly enjoyed the entire night. Thanks for sharing. I have lost count of the number of times I’ve seen “Seven Brides for Seven Brothers”, but I’ve never seen it on the big screen. I did see a touring company of the stage version in the 80s starring Miss Powell and Howard Keel. When that beautiful baritone walked out on stage in his buckskin costume and started singing “Bless Your Beautiful Hide”, the audience sighed as one. The road to Hollywood had scheduled Ben Mankiewicz with Angie Dickinson showing “Rio Bravo” in Toronto on March 31st. My heart was breaking as it is the night “my” choir is doing Mozart’s Requiem. However, the event has been changed to Ben and Peter Bogdanovich presenting “The Last Picture Show”. I’ve attended a couple of screenings with Bogdanovich in the past so it doesn’t feel like I’m missing out on a once in a lifetime opportunity. I would have loved to have seen Angie, Ben and “Rio Bravo” though. The audience reaction at the start of “Bless Your Beautiful Hide” was similar in our section of the theater. 🙂 One of the things I really loved about seeing this with an audience of fellow fans was the applause that erupted at the end of each musical number–you could tell everyone watching was really enjoying the experience. It’s a shame you couldn’t see Angie Dickinson–that would have been amazing! And to be honest, I’d rather sit through RIO BRAVO than PICTURE SHOW any day of the week (and I’m not even a fan of Westerns!). Where was the event held? At the Fox Theater? No, it was held in a small theater inside the Woodruff Arts Center. But as Jill points out in her review of the night, it was a much more intimate environment for the viewing, and it ultimately worked really well. Seems to me that watching the classics on the big screen with an enthusiastic crowd is one of life’s great joys these days. 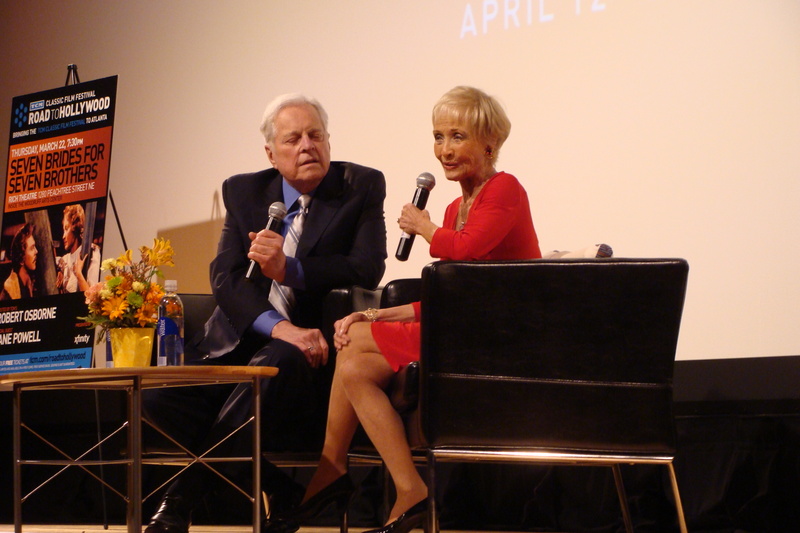 Your night with Robert O. and Jane Powell sounds (to not quitecoin a phrase) absolutely fabulous. Wish TCM’s road to Hollywood had come through this part of the world this year, but maybe next time. It was really worth the eight+ hours I spent on the road that day. 🙂 I hope it heads your way next year! It sounds like you had a great time! There’s nothing like watching films on the big screen with an admiring audience. You have no idea how jealous I am of you right now lol! Probably about as jealous as I am of all the lucky folks heading to the TCM Classic Film Festival in Hollywood next month!